WATCH VIDEO.Bosnian satellite DTH platform Hayat TV has launched its HbbTV service portal. 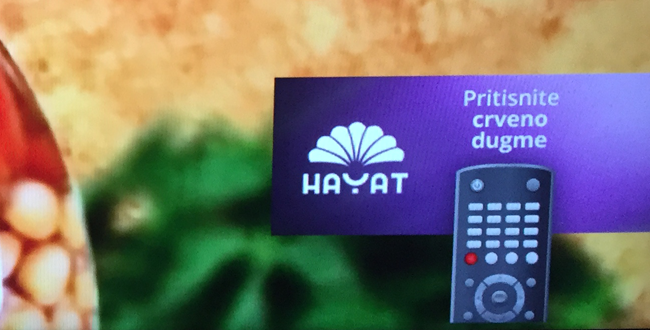 The Hayat TV HbbTV portal is available on the platform’s own Hayat TV channel and will be activated by pressing the red button. The portal is still in a test phase and offers a number of categories: news, weather, TV programmes, Twitter (#HayatTVBiH), and games. HbbTV by Hayat is a first in the country, as no local TV station in BiH or in the region offers HbbTV. Until now, only foreign channels, such as RTL and ProSiebenSat1, featured HbbTV portals. The portal was built with help of the New Media People (NMP) agency, backed by a team from Slovenia, and Castoola, in cooperation with the editorial and digital team of Hayat. Hayat also has an app for iOS and Android devices, and will soon launch a new web portal www.hayat.ba.